Breakfast has always been my favorite meal of the day. In Singapore, where I grew up, this first meal is not taken lightly — plates of spicy noodles and dishes of coconut rice paired with fried chicken or fish, eggs and flaming hot sambal sauce are common ways to start your morning. So it’s no surprise, then, that I’m all about the hearty, savory breakfast that works just as well for lunch. When my Let’s Lunch bunch suggested tackling “breakfast for lunch” for our April lunch date, I jumped on board right away. Leafing through my friend Joe Yonan‘s new cookbook “Serve Yourself: Nightly Adventures in Cooking for One,” I had spied several delectable-looking recipes in his chapter on tacos. One called out to me more than the others: Austin-Style Breakfast Tacos, which Joe began whipping together as a college student in Austin years ago. Joe — who happens to be the Food Editor at the Washington Post — has created something both simple and delicious here, however, and he explains the steps very clearly. You basically microwave the potato, chop it up, fry up some chorizo, add potatoes then scramble some eggs, heat up tortillas and assemble. The one thing that tripped me up a little was the fact that the tortillas I had bought were a little small, making the folding over of the tortilla to melt the cheese before eating a tad difficult. As you can see below, this was a pretty packed tortilla even before the cheese and salsa were added. This is, however, not a bad problem to have. Eaten open-faced, a la tostada, Joe’s breakfast taco provides a mouthwatering start to any day and is certainly oomphy enough for a midday meal. A lunch of champions, indeed. Don’t forget to check out the Let’s Lunchers’ breakfast for lunch offerings below! And if you’d like to join Let’s Lunch, go to Twitter and post a message with the hashtag #Letslunch — or, post a comment below. Line a large plate on one side with a folded paper towel. Pierce the potato all over with a fork and microwave on high for 3 minutes. Let cool, then cut into 1/2 inch pieces. Break the eggs into a small bowl and whisk to combine. Put a small skillet over medium heat. Slice open the chorizo casing and squeeze out the sausage into the pan. Break it up with a spoon and saute until it browns and becomes crisp, 3 to 4 minutes. Add the potato pieces, stir to combine and cook for another minute or so until the potato is colored from the chorizo. Transfer to one side of the prepared plate and cover with a piece of aluminum foil to keep warm. Warm the tortillas and wrap them in foil to keep warm. Wipe out skillet, return it to medium heat and pour in the oil. When it shimmers, add the eggs, stirring and cooking them until they are set but still moist, 1 to 2 minutes. Immediately scoop them onto the other side of the plate with the chorizo-potato mixture and cover with foil to keep warm. Lay the tortillas out on a plate. Divide the chorizo-potato mixture between the tortillas. Top with the eggs and a sprinkling of cheese. Close the tortillas to let the cheese melt slightly, then open them, spoon the salsa evenly over the other ingredients, close and eat. 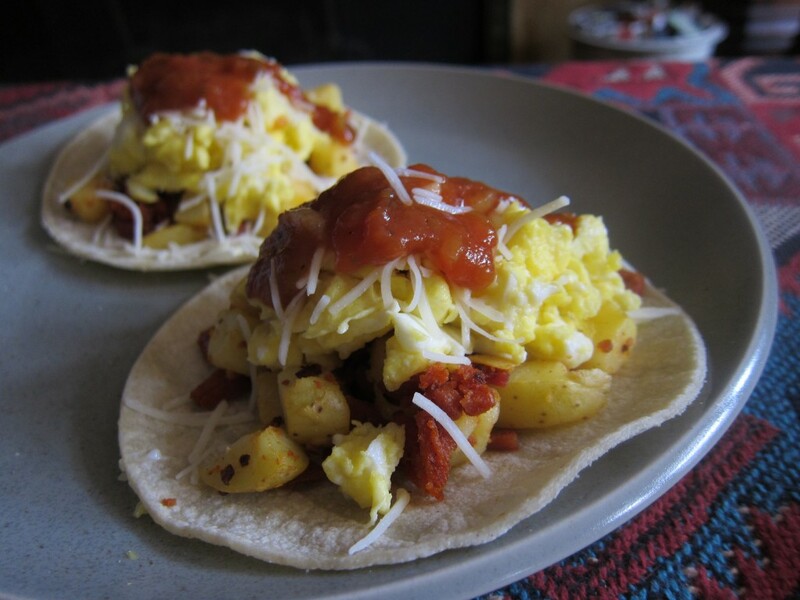 This entry was posted in Books, Breakfast, Brunch, Let's Lunch, Mexican by Cheryl. Bookmark the permalink. These look like the perfect start to a day! I kind of want to have a beer with them!!! xo C.
Simple & yummy, that’s the best. I love me chorizo and will have to make these soon! I’ve never been to Austin but I so want to go! If you like tacos, you should check out Joe’s book. The chapter on tacos is amazing. I sampled his Korean shortrib tacos at his book party and my god, they were outstanding. I’m planning to make them myself as soon as I have time to get me some kim chi! I ate breakfast tacos – with roasted green chile, no less – every day when I was in Santa Fe last month and I often make them here in Paris when I’m short on time, and craving something that tastes like home. In Texas, we make them like you did – with chorizo, potatoes, or both. Or with cheese. Or with whatever you’d like, really. Lots of places only serve them ’til 11 am, which drives me crazy. Don’t they know about the goodness of having breakfast-for-lunch? 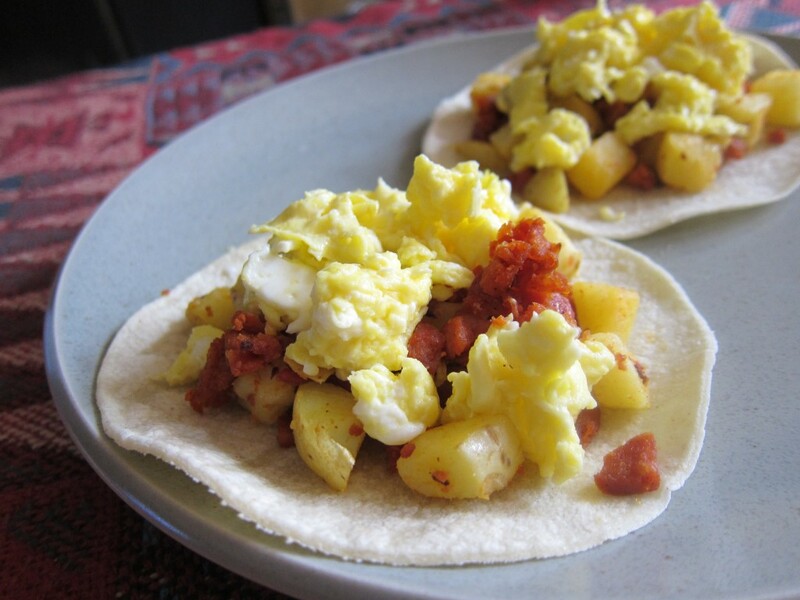 I’d love to see a Parisian version of breakfast tacos — hmm, what would go in it? I’m hungry just thinking about it! Excellent! Eggs tostada is my favourite breakfast before playing tennis – it’s the best energy boost. For ages I was getting it to take-out from my neighbourhood breakfast place, but coincidentally just made up my own version last weekend! No photos though – disappeared too quickly… Must try Joe’s version this weekend. Heehee, I loved that you packed every inch of that tortilla with ingredients – part of the fun that comes with eating with your hands isn’t it?? Those Korean shortrib tacos sound divine. Namu, a modern Korean restaurant in SF, are known for them.